A few weeks ago I came across a very cool commemoration of Gourmet magazine’s favorite cookies from 1941-2008. They chose their favorite cookie from each year, made them again and shot photos, then posted the recipes exactly as they had been originally written. As it turns out, I wasn’t the only food blogger who enjoyed the feature. After some Twittering and email back and forth, we got together a group of eight bloggers and started baking cookies. Eight bakers with 68 cookies to choose from. What a delicious dilemma! We each chose our favorite cookies from the bunch, 12 per person, and we’ll post one cookie per day from December 1-12, our own little 12 Days of Cookies. To make it even more fun, we decided to keep our choices a secret from each other just to add a little suspense. For my first cookie I chose the Cajun Macaroons, partly because they were the first (oldest) cookie in the bunch and partly because it gave me a chance to use almond paste in a cookie, which I had never done. The recipe calls for pastry flour, but if you can’t find it you can substitute White Lily All-Purpose Flour (not self-rising). If you cannot find either, Ochef recommends using part cake flour/part all-purpose flour in a ratio somewhere between 2:1 and 1:1. I used whole wheat pastry flour to make them a little healthier and just to see how it would turn out, and I like the flavor and texture. I also added some dried currants for a little variation. The recipe says to let the finished cookies sit for at least three days before eating, and after sampling one still warm I understand why. It was very soft in the middle and needed time to harden, and the almond paste really stood out. In the end I had to leave them in the oven for a few extra minutes to get the best color and texture. I like the flavor and the bit of crispiness on the surface. They are very rich due to the almond paste, and I think smaller is better. I used a #60 scoop to shape the cookies, and in the end felt that size was too large for such a delicacy. 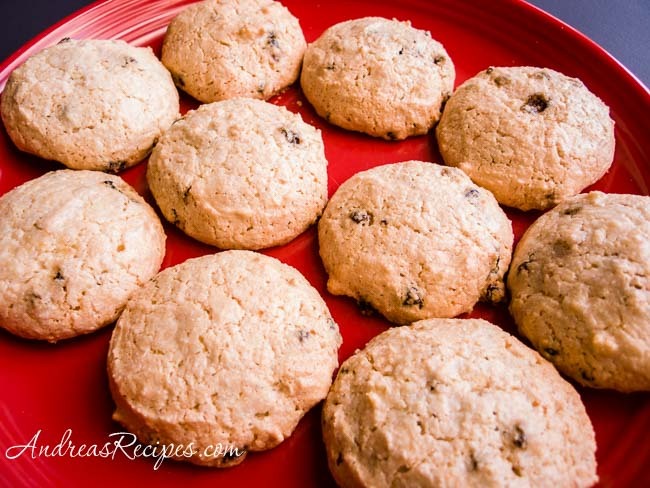 Be sure to visit all the other members of our cookie clan to see what cookies they chose as well as the Gourmet website to see all their favorite cookies from 1941-2008. Adapted from Gourmet magazine, 1941. Place the oven rack in the middle and preheat oven to 300° F/150° C.
In the bowl of the stand mixer on medium speed(or the food processor or in a bowl with a wooden spoon), work the almond paste until it’s smooth. Add the egg whites and blend thoroughly. The mixture will look a little soupy at first, but will come together. In the small bowl, sift together the sifted pastry flour, granulated sugar, and powdered sugar. 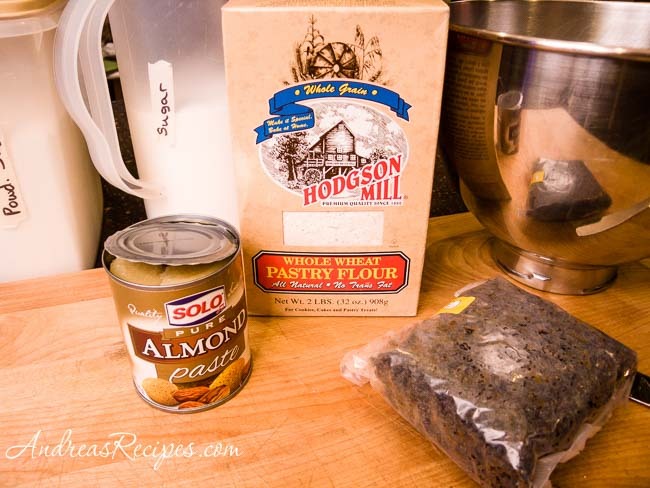 Add to the almond paste mixture in thirds and mix just until combined. Drop the cookies by the teaspoonful onto the lined baking sheet. Bake for about 30 minutes. Remove from the oven and allow to rest on baking sheet for a couple minutes, then transfer to a wire rack. Allow to cool completely, then store in a tin in a cool dry place. Tastes best after they sit for a couple days, and will keep for several months. Add finely chopped or ground fruits when mixing. 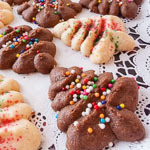 Shape cookies with a cookie press or with a pastry bag and tip. 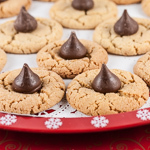 Decorate by placing half a nut or a raisin on top of each cookie before baking. Decorate baked cookies with frosting. Yummy and beautiful! Thanks so much for this. It is so much fun! what a fun way to spend the next 11 days. The cookies look great. You know I think Ruth Reichle said these were her favorite in this months cookie edition. I lovew almond paste. When I saw the description of Cajun, I though it may have some spice kick. Thanks for inviting me to participate. Its fun! 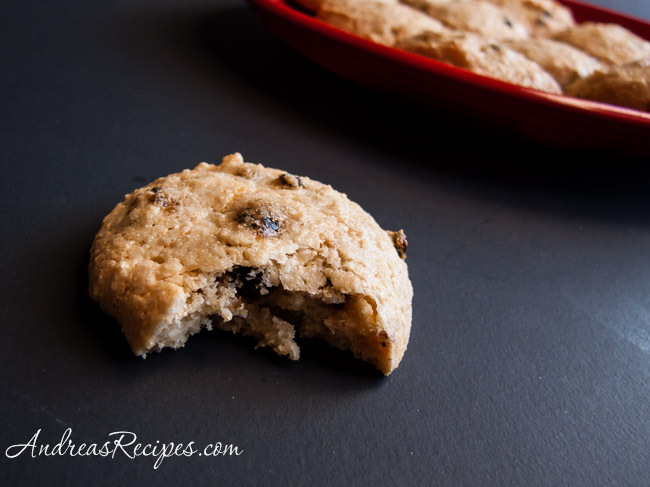 Nice choice — I love the taste of almond paste and your cookies look just perfect. Nice touch that you chose the oldest cookie. I think I grouped mine from a production standpoint. We’ll see how that goes. Thanks for the invite, Andrea. I haven’t made more than one or two batches of holiday cookies in years! ooooh, almond paste. I’m having so much fun seeing what everyone’s making! Thanks for putting this together Andrea! Saw story about Gourmet Cookie cookbook today on Sunday Morning on CBS. 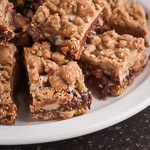 Went to their site and no recipe – was thrilled to find your blog w/ this recipe. Thanks! I have made this recipe 3 times now and the batter turns out like soup. The cookies spread and are not the perky crisp little confections pictured here. I have followed the recipe exactly. I even made my own Almond Paste. Any thoughts about what I am doing wrong? Do the eggs need to be beaten to foamy? Are the cookies a bit like a meringue? I have used Room temperature large eggs, sifted cake flour (Swans Down), and worked the Almond Paste with a wooden spoon once and a food processor once. My brother gave me the Gourmet book for Christmas and I want to make the cookies for him, but so far each of the recipes I have tried just don’t “set up” the way I would like. I consider myself a capable cook, so I am perplexed about what I am doing wrong.